British society is not paying enough attention to how a death may risk pushing families into poverty and could learn valuable lessons from West Africa, according to a new report. Researchers from the University of Reading and the Open University say Britain could actually learn much from the example of less affluent countries in Africa, such as Senegal. Dr. Ruth Evans’ and colleagues’ research explored people’s experiences of a family death, and analysed levels of financial, emotional and practical support offered to bereaved families in urban Senegal. The study, funded by The Leverhulme Trust, provides the first in-depth understanding of responses to death, care and family relations in an urban West African context. 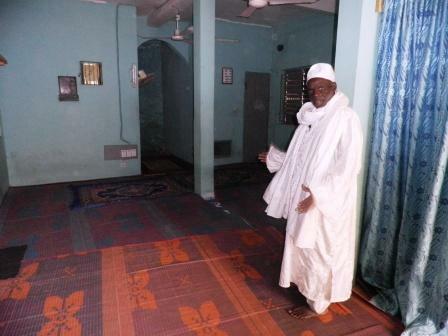 A local mosque, Guédiawaye, Dakar. We are continuing with our analysis of the data, as we receive the transcripts. 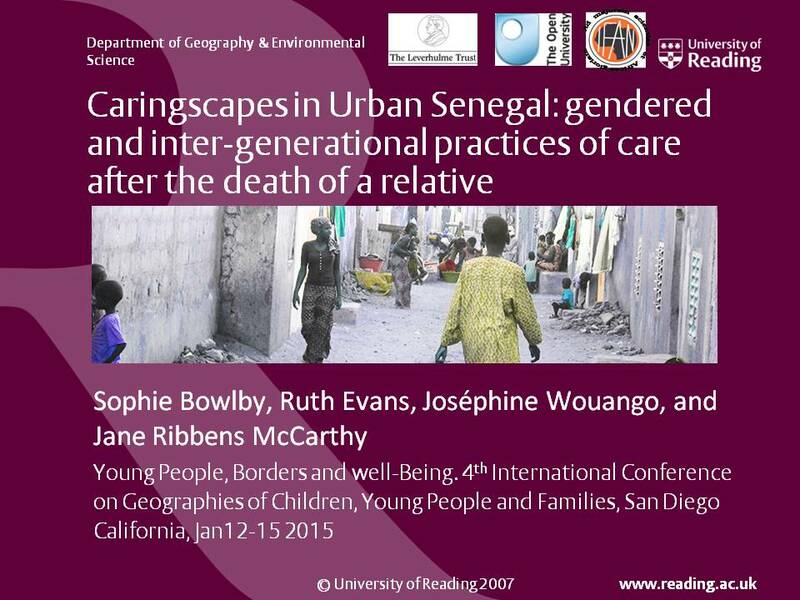 We recently presented a paper: ‘Caringscapes in Urban Senegal: gendered and inter-generational practices of care after the death of a relative’, at the Family Geographies, Care and Relationality sessions that Ruth Evans, Sophie Bowlby and Sally Lloyd-Evans convened at the 4th International Conference of Geographies of Children, Youth and Families, San Diego, USA, 12-15 January 2015. It was good to receive questions and feedback about our initial analyses of the transcripts from the first district in Kaolack. We have completed the fieldwork! Ruth, Josephine and Fatou conducted the fieldwork from May to July 2014. We recruited a diverse sample of 30 families predominantly of Wolof, Serer and Hal Pulaaren ethnicities in two areas of each of the two selected cities (Dakar and Kaolack). Médina and Guédiawaye were selected as contrasting areas of Greater Dakar, while Touba Extension and Kasnak were selected in Kaolack following discussions with Senegal Advisory Group members and representatives of APROFES and AFEME, women’s rights organisations. Families in the four areas were identified through a local facilitator, local or religious leaders and efforts were made to ensure diversity in ethnic and religious affiliation and socio-economic status. In total, we conducted in-depth interviews with 59 family members (2 in each family) who had experienced the death of a relative. The majority of families were Muslim and a small number (6) were Roman Catholic. Family members were selected on the basis of differing generational positions within households and on the basis of their relationship to the deceased. We also prioritised children and young people where possible. We interviewed 20 key informants, comprising local and religious leaders, community-based organisations, government and NGO representatives working at local and national levels. We also conducted four focus groups (one in each area) with groups of women and young people to explore community members’ perceptions of the neighbourhood and discuss cultural and religious practices and norms surrounding death, mourning and grief. All the audio-recorded interviews and focus groups are now being transcribed and translated into French and English and we are developing our approach to data analysis through reflexive conversations among the research team. We plan to present a paper reflecting on the methodological issues raised by qualitative cross-cultural research that investigates responses to death at the Inter-disciplinary.net conference, Making Sense of Suffering, Dying and Death in Prague, 1-3 November 2014 , if you’re planning to go! We have started the fieldwork! We held our first Advisory Group meetings in Reading and Dakar at the end of April and early May. Our discussions were very useful in refining our research instruments and thinking about language issues and our approach to accessing participants. Since then, Ruth, Josephine and Fatou have started the fieldwork in Dakar and Kaolack, working in two contrasting districts in each city. Key contacts with women’s organisations and local facilitators are helping us to access key informants and a diverse sample of families who have experienced a death in the last five years. Dr. Ruth Evans and Dr. Jane Ribbens McCarthy (The Open University) have recently been awarded funding from The Leverhulme Trust to lead an innovative research project on ‘Death in the family in urban Senegal’ with Dr. Sophie Bowlby and Dr. Josephine Wouango (University of Reading), in collaboration with the Laboratoire de Recherches sur les Transformations Economiques et Sociales (LARTES-IFAN), Université Cheikh Anta Diop, Dakar.